Did you know that there are over 50,000 established roofing companies in the USA alone? That means you have some competition. If you’ve been experiencing a lack of clients, it might be time to step up your marketing. You can’t just rely on referrals and the classic way of going about business. There’s hundreds of ways to market your business and it’s not wise to rely on just one or two methods. You need what I call a marketing machine — a system that works around the clock to bring clients to you passively. Wouldn’t that be nice? Well, keep reading if you want to learn how to get more roofing leads and make that a reality. If you don’t advertise your business, how will anyone know it exists? You don’t have to spend a heaping amount of money to start advertising either if you follow the steps I lay out below. 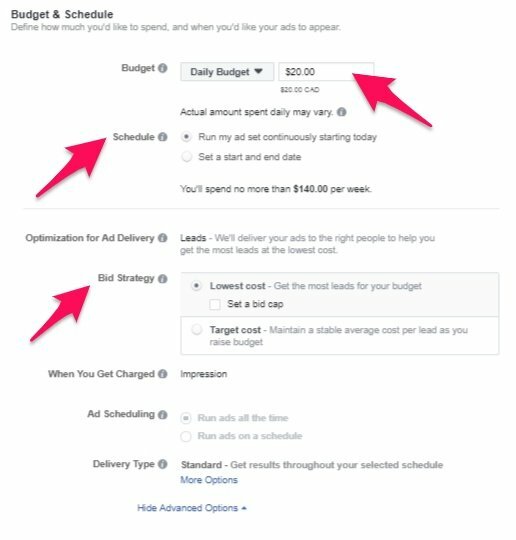 93% of companies that pay for social media ads use Facebook ads. This shouldn’t be very surprising, though. Their platform has incredible targeting capabilities and data to work with. Ads can be very affordable when configured correctly and it can passively bring you commercial roofing leads or residential. You will need a Facebook account first before you able to use the platform, so sign up if you haven’t already. For those have an account, click the “Create an Ad” button. There’s over a dozen different campaign goals you can choose from. These all have their own unique tools and costs. Since you’re trying to get more roofing leads, opt for the “Lead generation” option and give you campaign a name. 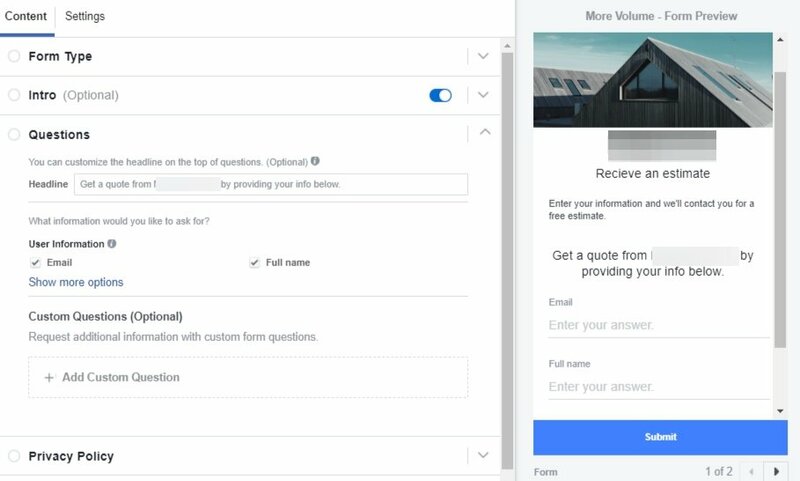 Select your business Facebook page from the dropdown menu. This will be attached to your ad for users to click. 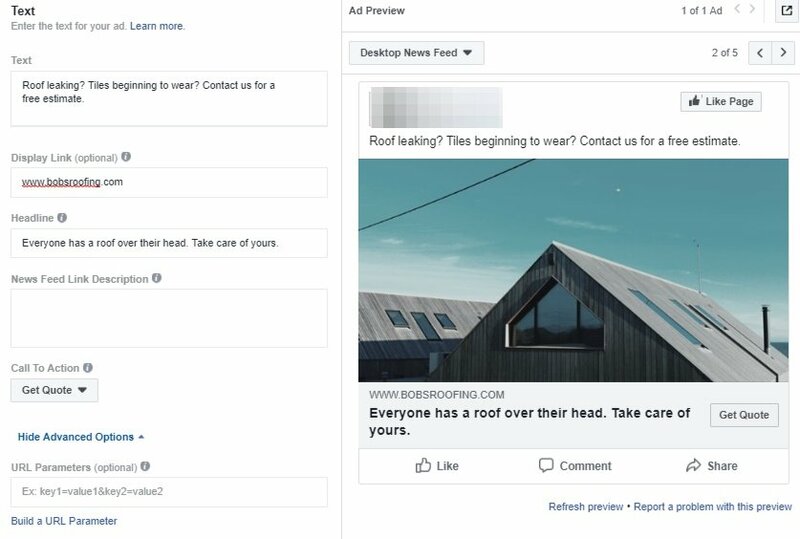 As a roofing company, you’re probably going to be targeted local customers, right? Then it only makes sense to set your Facebook ad targeting to align with this. Let’s say you operate out of Toronto and only go approximately 35 miles out for work. You can set your radius to exactly that. After this, you need to refine your target’s age, gender, and language. Your own experience and data can help you adjust these features. Free market reports are great resources to collect this kind of data on your customers. Paid ones can be quite expensive, literally in the thousands of dollars — which is why I suggest browsing for summaries, trends, and key drivers of the industry. A quick Google search resulted in a lot of useful sites, including this one that contains the most popular products, niches, and more. Now it’s time to set budget. That’s a scary word, huh? It doesn’t have to be. Even just $5 to $10 per day can get you roofing leads. As your ads run over time, you can optimize them to perform better. If they perform better, you make more money. If you make more money, you can increase your budget. Set an amount that you’re comfortable with and a schedule. You can’t go wrong with a low cost bid strategy, either. Making ads is all about keeping it simple, then refining and optimizing as time goes on. Move onto the next page nad you will be prompted to choose an ad format. Starting with a single image, carousel, or slideshow ad is best as you may not have a video prepared. Upload an image or choose from the free stock photos Facebook offers. I love using Unsplash or Pixabay for commercial use images. They have literally everything and they are all free. The text portion of the ad appears above the image. This is where you want to use copywriting strategies. Don’t make it boring or dull. What do your customers really want or what are they feeling? If someone needs roofing services, usually it means that there is damage, leaking, or similar. Use those aspects in your ad copy. It brings out emotion in users and it speaks to their needs. Scroll down and select to create a new lead gen form. Go through the individual sections and fill out the needed information. After you’re satisfied, hit the finish button on the top right. You’ve successfully created your first Facebook ad, congratulations! Just click the confirm button and it will be quickly reviewed before being shown off to the world. What marketing machine would be complete without SEO? Search engine optimization is the golden ticket for any service business. When done correctly, it will get you consistent clients without having to go to them. 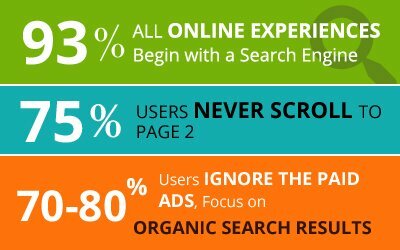 Almost all experiences online begin with an organic search. Your ideal customer might notice a leak in their roof and search Google for “How to fix leaking roof” or “Local roofing companies” to solve this problem. With SEO, you can intercept them by using these phrases and keywords on your website. Your business appearing in front of them just when they need it the most. I always cringe a bit when I see businesses not optimizing their website’s for search engines, their missing out on free money! If you don’t have a website, that’s the first step. Feel free to contact me and I’ll help you build a site that generates traffic and leads. Once you do have a website, it’s time to perform keyword research. We’re going to be focusing on local keywords, as they have less competition and you can rank for them easier. Type in “roofing company” after your city name and click the search button. 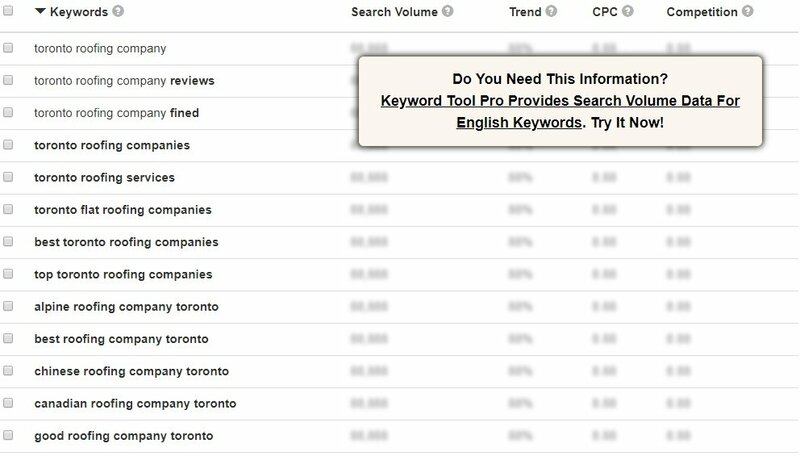 You will see tons of related keywords that clients are going to be searching. Collect a dozen of these into a spreadsheet or text file. I personally use WordPress, which makes adding keywords to these elements very easy. Get a freelancer or employee to do this for you if you’re not too tech savvy. I’d recommend taking the time to learn how to do so, though. It’s a great skill that you will use time and time again. You want to run your business and do every little task. But there is so much potential when you partner with other companies. They can refer leads to your roofing company or flat out get you jobs. The key is to partner with a company that doesn’t directly offer the same services, but does work on houses. See what I mean? They have their own unique set of services but are in the same space as you. Head over to Google and research local companies like these. Let’s imagine that this first website I highlighted above seems like a great partner. The next step is to send them a pitch. I’ve sent thousands of cold emails in my days as an entrepreneur and I’ll let you in on a secret. It’s all about creating genuine relationships and friendships with the businesses you partner with. Find their contact form or email. It’s usually in the footer of the website. 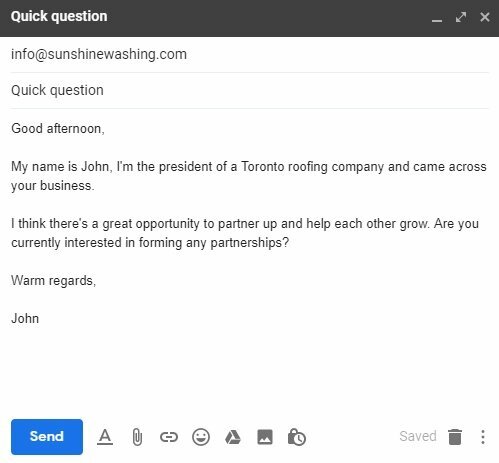 I’ve found that a subject line with the individual’s name has the highest open rate. Something simple like “Hey X” or “To X” works great, but “Quick question” is a nice general one, too. If you get a positive response, schedule a discovery phone call. It should be used to ask questions about each other’s businesses, goals, and to get to know one another. After this, I typically enjoy setting a date where we can meet for coffee. Remember that the partnership has to be mutually beneficial. If they are going to refer you roofing leads, you need to help them get clients, too. Let’s say that you finish a roof for a customer and notice that their driveway could use some improvement. Hand them your partner’s business card and tell them to say you referred them. So, you own a roofing company and need more leads. Instead of relying on referrals like most of your competition, you need to work smarter. 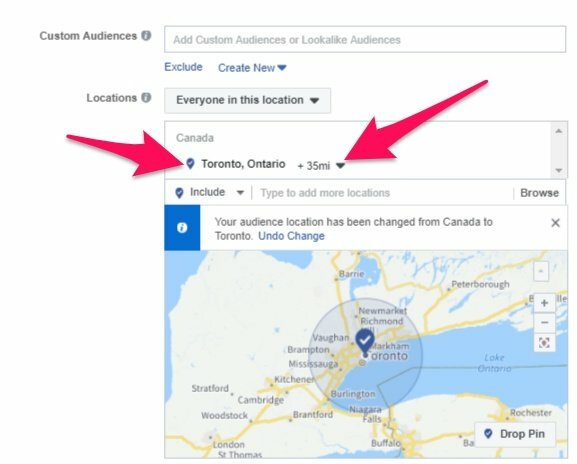 Start off by creating Facebook ad campaigns. This will place your services right in front of your target audience and you can include a lead generation form right into ads. A small budget of $5 to $10 is more than enough to begin collecting data to refine your campaign, while getting some leads, too. Use calls to action, emotion, and focus on what the client really wants. Maybe it’s a better looking house or a quick solution to a leak. While those gradually get you users contacting you, optimize your website for search engines. This begins with keyword research with tools like Keywordtool.io or Google’s Keyword Planner. Find local keywords that relate to your location and services. 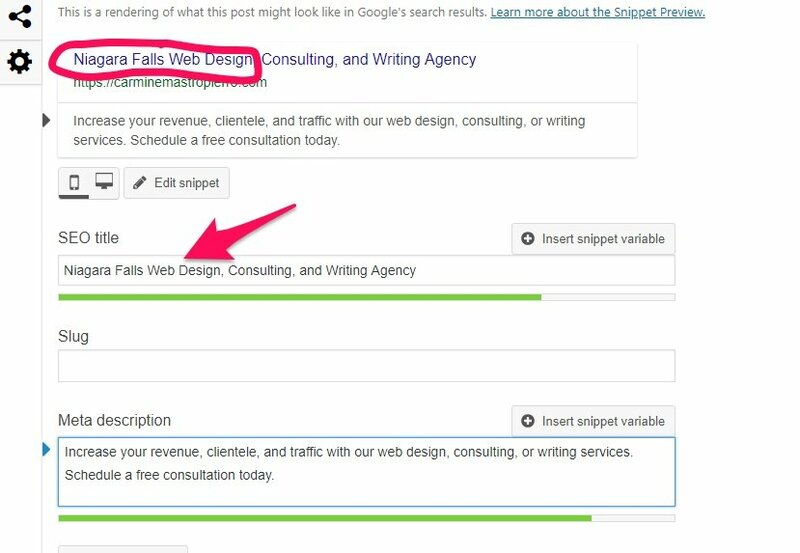 Place these within pages on your site, content you write, and areas like title tags. This helps search engines understand that you own a roofing website. In return, more users searching for those phrases will naturally find your business. Form partnerships with companies in your local area that don’t offer competing services. Build a real relationship and try to help one another grow. Using these strategies in combination is guaranteed to get your more roofing leads. What are you waiting for? Start executing today! Previous articleMarketing Ideas for Window Cleaning Businesses [Double Your Clients]Next article SEMrush vs Google Keyword Planner - Who Wins?